The analysis module provides add-on capability for measurement of pH in ambr® 15 and ambr® 250 high throughput bioreactors, for the purpose of initial bioreactor vessel pH sensor calibration and subsequent in-process re-calibration. The analysis module eliminates the operator time needed for manual pH sample transfer, measurement, data transfer and bioreactor pH sensor recalibration, by fully automating this process. Operation of the analysis module is supported by user replaceable sensors (electrodes) and reagent kits including calibration solutions, cleaning solutions and a waste container. 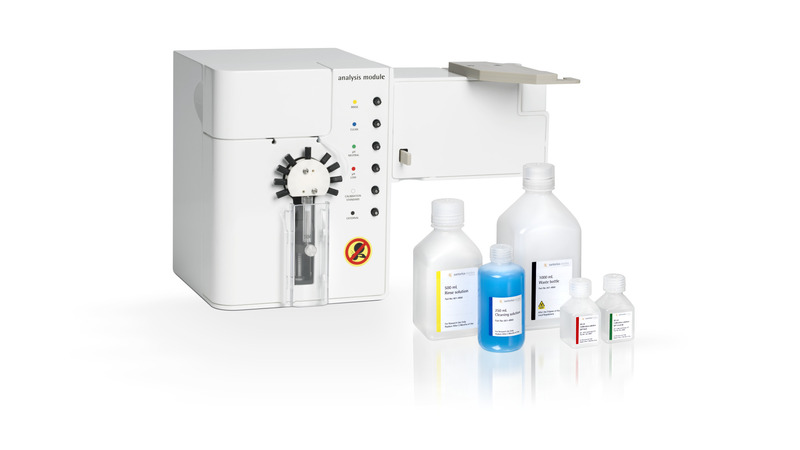 analysis module is suitable for use with both cell culture and microbial media. analysis module is not suitable for use with particulates (for example microcarriers will block internal tubing) or highly viscous cultures or samples (e.g. filamentous microbes).